Types are the kinds of objects which will appear on your overview, for example stargates, battleships, and NPC pirates. States are properties of those objects, mostly relevant to other ships. These include having high standing, being in your corporation, and so on. Types are fairly easy to get your head around - ticking 'stargate' for example will make stargates appear on your overview, while unticking it will remove them. Simple! States are more complex in that a single object can satisfy multiple criteria at once, for example by being both in your corporation and also having good standing, having negative security status and no standing (since 'has no standing' is also one of the options), and so on. The game doesn't really make it clear how it's going to treat these examples, and the answer is not particularly intutitive. What really matters is not what you have ticked, but what you have unticked - what state filters are actually doing is removing the things that you don't want to show up on your overview, rather than adding the things that you do. Let me put that in context; let's say I have 'pilot is an outlaw' ticked but 'pilot is in my fleet' unticked. My overview will interpret this by not displaying any pilot who is in my fleet, including pilots who are both in my fleet and an outlaw. This setting will not display all pilots who are outlaws - it just won't explicitly remove them simply for being outlaws. Because of states working in this way, some settings that you'd probably consider fairly obvious are actually very difficult or impossible to create. For example if you're a hisec corporation, you can't create an overview setup to show only war targets*. You can save as many different sets of filters as you like and switch between them at will. Since you generally won't want the same things on your overview for your 200 man POS bashing fleet as you would when you're roaming solo, I highly recommend taking advantage of this and setting up as many different combinations as you think you'll use. For any given situation, think about what you'd want to see on your overview and what you wouldn't. In a very large fight such as part of a sov conflict, your overview space will be at a premium - the more you potential targets you can fit on a single screen, the faster you'll be able to find primaries. Anything which isn't a ship will probably need to go, and you might eve want to turn off low-priority ships like capsules and t1 frigates so you're only seeing potential primaries. In small gang PVP on the other hand situational awareness is key, and having things missing from your overview that you might need to quickly select or react to can be the difference between a fight won and a fight lost. Perhaps the most obvious example of this is the treatment of friendly ships. Traditional thinking dictates that you only want things on your overview that you can shoot (or that can shoot you), preventing friendly fire incidents and making it easier to select targets by reducing clutter. In fleet engagements this is definitely a very good idea, and since most new PVPers start off by tackling for a fleet it's a rule that gets passed on quite well. As with all good rules though there are exceptions, and as you become more confident in PVP you'll start to find situations where you might want to do things a little differently. For example most solo or very small gang PVPers (myself included) will fly with friendlies on their overview to help them keep track of who's on grid and how far away they are. Similarly if you're in Faction Warfare, you might want to remove fleet or corp mates, but keep 'friendly' militia members visible simply because they often turn out not to be. There isn't really a wrong answer to any of this (although there are a few that qualify as 'really bad'). It's all about what information you need in your typical PVP environment, and how best you can deliver that information given the limited space available. Type filters (but not state filters) don't just govern what appears on your overview; they also determine which objects are displayed on your directional scanner (assuming you have the 'use active overview settings' box ticked). Because of this, you'll probably want to include some objects on your overview that you want to see on scan, even if you don't necessarily care about seeing them in space (obvious examples being things like combat scanner probes and POS control towers). At a more advanced level, you may want to create overview settings specifically designed for directional scanning. The main filter sets that I use are as follows. If you're interested, an export of all of my overview settings is available for download from Eve Files. General PVP, including friendlies - My standard overview setup for solo and small gang PVP. It includes all ships as well as gates/stations for ease of navigation. POS force fields are also included so that I can quickly identify whether a ship on d-scan is POSed without needing to change to my scanning overview (this works better than using control towers since it takes out offline POSes). 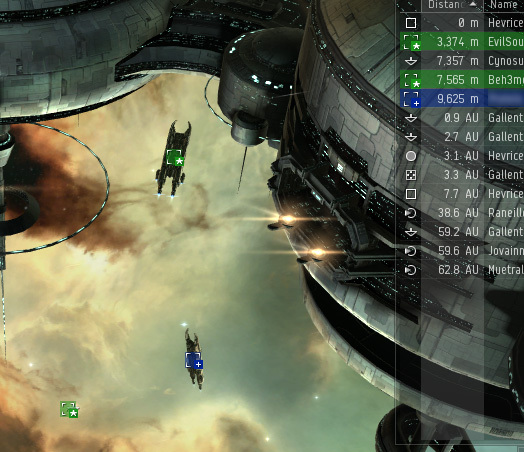 General PVP, excluding friendlies - Identical to the setting above, but with friendly ships removed. This is my standard setup for gangs larger than about five people. I also have an alternative version which keeps militia enabled, since militia members are often less friendly than you might think. Ships Only - Like the name suggests, this overview setup shows only ships. Both friendly ships and all capsules are removed. I don't use this often, but it comes in useful for large fleet fights where overview space is at a premium. Drones Only/PVP with Drones - These setups are for clearing drones. The first only shows only drones, and I find that's the one that I use most often - tab to it, lock the flight of drones that's attacking me, and then tab back. The second version is a variant of my normal PVP setup with drones added, and it more useful in prolonged fights where someone is micromanaging their drones. The latter option is less useful in fights with multiple drone-using opponents since the overview will quickly fill up. Scanning - I used to have multiple scanning filters with varying levels of detail, but found that I ended up using this one almost all of the time. This filter exists purely for directional scanning - it includes everything in my normal PVP setup plus moons and asteroid belts to help me pinpoint a target's location, and wrecks/drones so that I can quickly see whether someone is (or has been) actively PVEing. A quick and dirty alternative is just to uncheck the 'use active overview settings' box, but that can lead to a large amount of clutter when scanning near POSes. Planets - This filter shows all planets, stargates, and the sun. I originally created this as a 'pod saver' setting for getting my pod out quickly after losing a ship, however I find that I rarely use it for that. Instead, I mainly use this when hunting for targets as a quick way of checking which major celestials are inside or outside of my current directional scanner range. Everything - Does exactly what it sounds like. While this might seem fairly pointless, it serves one very useful purpose - when you're approaching a target cloaked, going within 2km of anything will decloak you. This filter helps makes sure that doesn't happen. Nothing - A good setting for when you want to pretend there's nothing around that can hurt you. Obviously I never actually use this setting - I just keep it saved to make it easier to throw together more specific overview settings on the fly. 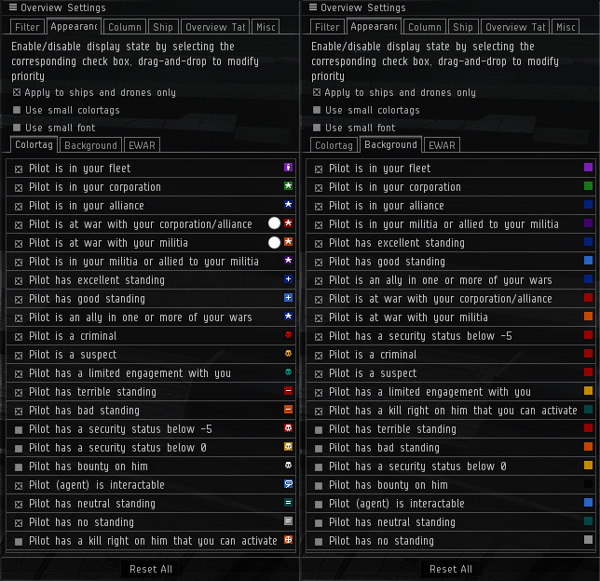 Colourtags are the small icons appearing next to ships or pilots in space, on the overview, and in chat windows (for example the red skulls for pirates and the green stars for corporation members). Backgrounds are exactly what they sound like - they fill the background of both the entry on your overview and the icon in space with a particular colour. Both backgrounds and colourtags have the option of being set to blink, and you can change the colours to whatever you like. Blink settings are independent (so you can have a colourtag blink but the background static), while colours have one setting for both the background and the colourtag. The third set of options available is EWAR; enabling the settings here will add a small icon next to the anything on your overview which is using an EWAR module against you. These all come ticked by default and there is really no sensible reason to untick them, so we'll leave it at that. Aside from making things pretty and colourful, the main benefit of appearance settings to a PVPer is in allowing you to distinguish between objects of different states as quickly as possible. Background settings only appear on the overview and on grid, but have the benefit of being really easy to spot. Because of that, the best use of these settings is for identifying objects that you need to tell apart in your immediate vicinity (for example telling valid targets apart from non-valid ones (if you have such a thing) or locating friendly ships on grid with you. Coloured backgrounds let me quickly locate these friendly pilots on grid, and on my overview. Colourtags are harder to tell apart in a cluttered environment, but are easy to distinguish when they appear in a list. Since they show up in chat channels (most importantly local chat), this makes colourtags best suited to identifying the number of friendly or hostile ships that're in system with you rather than on the overview itself. You can also use colour tags to supplement the information provided by backgrounds on your overview (for example by giving all outlaws a red background but also enabling the bounty colourtag for individuals with a bounty), however this is more of a secondary purpose. system is full of dirty pirates! Since a given object can only have a single background colour and a single colourtag, you can assign a priority to each of these by dragging them up and down in the list. For example if the colourtag for 'pilot is in your fleet' is higher in the list than 'pilot is in your corporation', corpmates who are also in my fleet will get the fleet colourtag instead of the corporation one. These lists are separate for both backgrounds and colourtags, so you can have different priorities for each if you wish. 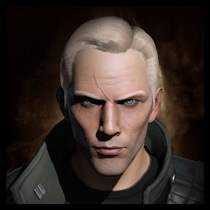 You can see my appearance settings below. My colour tags settings are designed around identifying key groups in local as quickly as possible: I want to know how many of my guys (fleetmates and corpmates) I have in local, followed by high priority targets (i.e. war targets and hostile militia - I want to see them even if for some reason they've been set blue). To help me notice war targets as soon as they come into local, I have that setting set to blink. Note that militia members (for those of you in FW) are prioritised lower than war targets since it is possible to be at war with other corps in your militia. I generally recommend not setting backgrounds themselves to blink, since this can make reading your overview more difficult. After that, it's all about standings. Normal practice is to use these to define your rules of engagement, with red targets being treated differently to blue targets and so on. In corps which don't differentiate between neutrals and hostiles (or which don't have traditional 'allies' to set blue), standings are often used primarily to identify different groups. In the Tuskers, we use standings to identify whether someone is a member of another PVP corp, a known falcon/booster alt, a member of our protection programme, and so on. In Agony on the other hand we would assign standings based on allied blocs; for example orange might be the local sov holders and all of their entourage, while red might indicate a group of other Syndicate residents who had NAPed up and could be expected to work together. In both cases, the aim is to provide key information at a glance - the Tusker method is great for identifying potential targets and threats, while the Agony method lets you figure out how many allies a hostile gang might have in system before you take an engagement. Neutral standing by default appears the same as no standing (the difference being that neutral standing indicates pilots who are explicitly set as neutral contacts, whereas no standing covers anyone who is not a contact). By changing the default colour for neutral standing I effectively give myself an category to play with, useful for tracking certain groups of targets on the fly. The two sec-status related settings are slightly odd in that they only show up on the overview, not in local. While there's not really any harm in knowing this, I personally don't find them that useful. My background settings help me to identify friendly and hostile ships both on the overview and in space - it's much easier to pick out a colour than work out whether someone has a skull or a star against them. First come all the people I don't want to shoot, marked in blue, green or purple. I know some people like to just set all friendlies to blue, and that's not a bad idea - at this point I've become so used to what the various colours mean that I just like having it this way. Next, red and orange backgrounds mark ships which can be legally attacked in lowsec (again, some people just like to set all legal targets red). This lets me pick targets from my overview that won't incur sentry gun wrath as well as identify when a neutral target has opened themselves up to being shot. Limited engagements I have a different colour, since while I can still attack them freely the same may not necessarily be true for my gang mates! Kill rights I just have tacked on the end - I've never actually used them, but it's nice to know. Columns let you determine what information your overview gives you about the things on it. Some of these are just plain common sense, while others might be personal preference. Be warned though - more columns on your overview can quickly eat up screen space. The columns available are below, entries in red are those which I personally have active for day to day PVP. Similar to appearance settings, you can drag these around to change the order in which they appear. Icon - It's an icon, it looks pretty. Distance - You'll want to know how far away something is if you're going to try shooting it. Common sense. Tag - Mainly useful in cooperative PVE, where one fleet member can 'tag' targets with certain numbers and everyone can see what order you need to kill them in. Some people use it in PVP, but there's no point having it enabled unless your corp uses it. 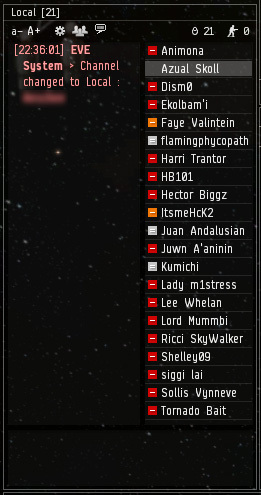 Name - Important in fleet PVP since it's the most common way of calling targets. Not quite as important for solo, but still useful so you can tie ships back to the names in local or tell two ships of the same class apart. Type - What kind of thing is it? Another popular choice for target calling, and essential information for any kinf of PVP. Corporation - The corp ticker of the pilot or object. Useful for picking out different groups on grid, particularly important if you're a scout. Alliance - Same as above, but the alliance ticker. Probably more useful than corporation if you're generally fighting people who operate at an alliance level. Faction - Tells you the NPC faction which an object belongs to. I don't really know why you'd want this. Militia - I've never actually used this, but I assume it tells you which militia a pilot is in. Probably not that useful since hostile/friendly militia members are already visible using the colourtag and background settings, and a text string would be a horrible way of trying to identify friendlies. Could be useful for identifying FW pilots if you're not in FW yourself. Size - The size of the object. While I've heard people claim this can help you figure out someone's fit (i.e. that it's linked to signature radius) as far as I can tell this isn't true. I'm not sure what it is, possibly the size of the model or the collision box. Not really very useful. Velocity - Tells you how fast a ship is currently travelling through space. This is useful for working one someone's fit, as well as quickly determining whether you have a speed advantage - if you know the ship well, this number can tell you whether they're running an AB or MWD, fitting a shield or armour tank, whether they have skirmish links or speed implants, and so on. Radial Velocity - This tells you the relative velocity of your target along the radial axis. In other words, it tells you if the target is getting closer (a negative number) or further away (a positive number). Remember that because this is relative, it takes into account your own movement as well as that of the target itself. Useful for working out whether you're gaining on someone when chasing/being chased, or for spotting when an opponent begins to change direction. Angular Velocity - This tells you how quickly an object is moving around you (or you're moving around them) and is expressed in the same units as tracking - radians per second. Useful if you're flying a ship with poor tracking like a sniper, since it lets you select a target that you know you're likely to hit. While this is a much more useful field than transversal velocity, the format combined with the number of decimal places can make it quite difficult to take in at a glance. As well as providing useful information, these columns are also your primary methods of sorting the entries on your overview. For small gang PVP I generally recommend sorting by distance - this makes it very easy to tell which targets are in range and who can potentially tackle you, as well as to keep track of the changing battlefield. This field is particularly useful in kiting engagements, where distance is critical and you'll generally primary whatever is closest to your gang. In larger fights, it will probably help to sort your overview by either name or type depending on the FC's method of target calling - if they're calling by name first (e.g. "Primary is Rixx Javix in the Bantam") then you'll usually find your targets quicker if you sort by name, and if they're calling ship type (e.g. "Primary is Bantam, Rixx Javix") it makes sense to sort your overview by type too. Of course, this assumes your FC is being smart with their target calling - it's fairly common for FCs to call targets by name first even when they're choosing them by ship type, which is obviously just intended to make your life difficult! They may ask you to sort your overview in a certain way, but if not, you'll have to just pay attention and figure out which method works best. The three remaining tabs in your overview settings window are less interesting. The Ships tab just relates to the tooltip information that you get when you select a ship, while the Misc tab (through some slightly odd UI design) exists only for a single checkbox. Thankfully it's a useful one - ticking the box here will automatically move any target which is broadcast to the top of your overview, assuming the target is one which shows up under your current filters. This can be great if you're in a big fight and the FC is broadcasting targets, but if you're not expecting targets to be broadcast (or if the use of broadcast is inconsistent) it can leave you scrolling up and down your overview unable to find a target in the list. Whether you turn this on or not is up to you, just make sure you know which way you've set it! The Overview Tabs settings at the end are worth discussing briefly. This section lets you choose up to five different overview settings to have active at any given time. These will appear on separate tabs across the top of your overview, allowing you to flick between them at will without having to select a new setting from the dropdown list. For each tab you can choose both one filter set for your overview, and another for the brackets that appear in space. I recommend using tabs for different filters that you might realistically need in the same situation, rather than mutually exclusive settings that are specific to the kind of fight that you're looking for. For example I find it very useful to be able to switch between my PVP, drones, and scanning filters on the fly, but rarely have so switch between my standard PVP setup and my 'ships only' setup, so there's not much point keeping that on its own tab. I haven't really found most situations where I don't want all brackets, however in large fights is can be useful to turn some off (particularly drones and wrecks) to reduce lag and clutter. Got an overview setup that works well for you? Do you or your corp use a convention that might be considered unusual? Let me know in the comments! You can download a copy of my overview settings here! * You can however get around this by creating one that only shows terrible standing (unticking the excellent, good, bad, neutral, and no standing options, and then leave everything else ticked). So long as you set your war targets to terrible standing at nobody else, this should create the same result. Great article - and it just so happens I recently wrote something very similar myself! It's interesting that you consider the Angular Velocity column to be of little use. I agree with that, but I've seen a lot of accomplished PVP-ers praise this column and figured I was behind on the curve somewhere. Well, *further* behind than might be expected of a garbage picker, anyway. Also, thanks for reminding me to take out the Tag column. It's a vesitgal remnant of my wormhole days. Very useful, thanks for the great article :). Downloaded the overview settings. I'm a fan of a GTFO tab which has major warpable bodies like planets, belts, stargates, stations, etc (not moons since you don't want to get pos killed) for warping out of a fight. Another cool trick is to use HTML formatting tags in your overview tab names to change the font size and colour.